It's going to be a great bonus season (if you were already in line for a bonus). While most workers don't expect to get a little extra something from their bosses this year, many companies are, in fact, doling out holiday bonuses. Of 368 human resource professionals and executives surveyed in Bloomberg BNA's annual Year End-Holiday Practices survey, 42 percent said that they planned to give end-of-year bonuses, with most employers opting for cash over gifts. After a small dip during the recession, that number has stayed consistent over the past four years. 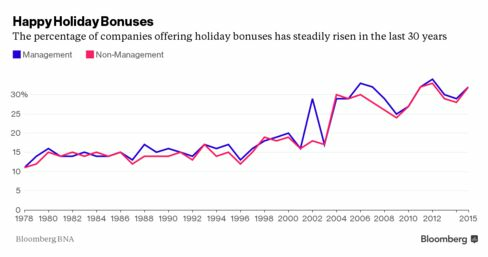 In fact, over the past three decades, the share of companies offering holiday cash bonuses has steadily increased from about 10 percent in 1978 to around 30 percent this year. Who gets a holiday bonus, and how much they get, depends on their jobs. "Workers in the nonbusiness sector (e.g., health care, education, government), larger establishments and union shops should not get their hopes up," the report said. Bonuses flourish at small, private-sector companies. Half of respondents with fewer than 1,000 workers will distribute bonuses in some form to their employees. Only about a quarter of larger companies surveyed said they would give out bonuses. Those who are getting bonuses, however, will get bigger ones than ever. The numbers vary depending on the institution and job type. At the high end, some managers will get as much as $40,000. Managers earning the median can expect a check for around $725, up from $500 last year. Nonmanagement employees will get around $500, up from $200 in 2014. A majority of employers still opt out of holiday, nonperformance-based bonuses. More common are incentive-based rewards. "Pay for performance is what it's all about today," John Challenger, chief executive officer of the Chicago outplacement company Challenger, Gray & Christmas, told the Society for Human Resource Management. An Aon-Hewitt survey found that variable pay made up 12.7 of paychecks in 2015 in the U.S., up from 8 percent a decade earlier, with 93 percent of the 1,064 companies surveyed offering some type of bonus program—although those bonuses are reserved for certain workers, too. Fewer companies are giving bonuses to "nonexempt" employees, meaning people in jobs eligible for overtime pay, such as administrative assistants and machine operators, reported the Washington Post earlier this year. Just like benefits, bonuses are more attractive to recession-scarred organizations than salary increases. "Employers like the fact that it's not adding to their fixed expenses," said Ken Abosch, who heads up broad-based compensation at Aon-Hewitt. In case the economy tanks again, companies can forgo bonuses instead of firing workers or slashing salaries. "Organizations find it gives them more flexibility in managing their costs."